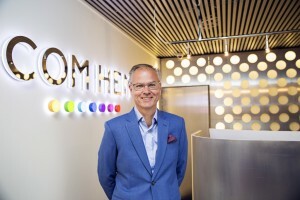 Com Hem expects the box-less TV offering it launched earlier this year to become its main TV service in the future as consumer habits change, while its Android-based TV Hub service is now being sold by both its Com Hem and Boxer brands, according to CEO Anders Nilsson. In comments accompanying the Swedish cable and pay TV operator’s Q2 results, Nilsson said the company was focusing on developing its box-less ComBo offering “to turn it into our main product in the future”. Earlier this year, Nilsson said that evolving towards an OTT TV offering was “a natural next step” for the operator, enabling it to o bundle the best on-demand content and deliver it to users in its footprint that are not traditional TV customers. Nilsson also said that Com Hem’s Android-based TV Hub, which it launched in April as a TV offering alongside its existing TiVo product, was now being sold via both Com Hem’s main brands and “should serve to further enhance customer satisfaction” as it “perfectly matches the viewing habits of today’s consumer”. Nilsson said that Com Hem’s management was seeing more activity from competitors in offering converged services, with fixed-mobile bundles being offered with added value rather than marketed through discounting. “While this had a slightly dampening effect on volumes in the quarter, we see this as a positive development in the long run as it should benefit both consumers and operators by encouraging operators to improve services and increase customers satisfaction. We believe that this natural development in the market will reduce the overall market churn and make pricing more resilient,” he said. Nilsson said the trend towards convergence made Com Hem’s upcoming merger with Tele2 “even more timely” and would enable the combined company to drive convergence in the Swedish market. Nilsson said that Com Hem had now completed the integration of digital-terrestrial and fibre operator Boxer and expected synergies to be realized through the second half of the year. While Boxer’s churn’s remained high at 16.6% due to price increases, with its overall subscriber base declining by 7,000 and total RGUs falling by 6,000, the operator added 4,000 broadband RGUs in the quarter. Com Hem’s group revenue was up 1.1% to SEK1.815 billion (€177 million). Operating profit was down 3.6% to SEK214 million due to exceptional items. EBITDA was down 2.1% to SEK693 million. Com Hem said that underlying EBITDA was up 3.8% to SEK758 million and cash flow increased by 11.4% to SEK533 million.